Tyson Nash was born March 11, 1975 in Edmonton, Alberta, Canada. Nash is the great-grandson of Conrad and Elisabeth Albrecht from Norka. Nash played his junior career as a professional hockey player with the Kamloops Blazers where he was part of the team which won three Memorial Cups. He is one of only three players to have won three Memorial Cups with the same team. 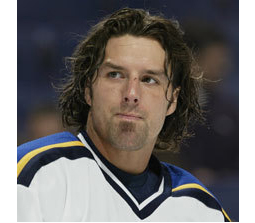 Nash went on to spend five seasons with the National Hockey League (NHL) St. Louis Blues. Tyson also played for the NHL Toronto Maple Leafs. After his NHL career, Nash played from the Phoenix Coyotes' (now the Arizona Coyotes'). Nash announced his retirement on September 11, 2008. He last played for the Nippon Paper Cranes in Japan during the 2007–08 season. Nash was hired as the Arizona Coyotes' TV analyst alongside Matt McConnell following his retirement. Wikipedia.com article on Tyson Nash (August 2015).